Recently I started using Visual Studio 2010 Professional Version. There are lot of new features in VS 2010 which goes without saying. One of the areas which i frequently work on is databases. 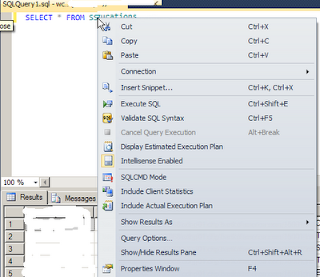 There is a lot of integration between VS 2010 and the upcoming SQL Server 2012 version. 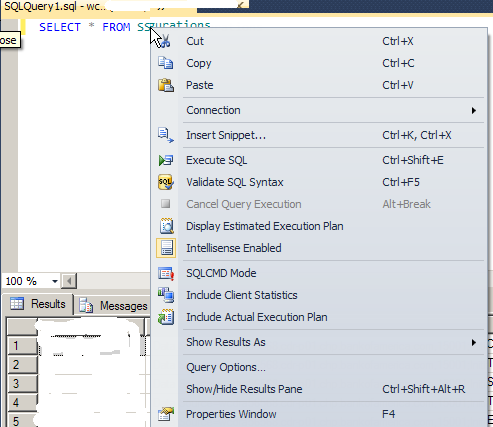 Once a connection is established to a SQL Server using the server explorer, one can view the objects within the database in the server explorer. In the menu option Data when you choose Transact-SQL Editor, at first you are asked to log in to SQL Server, once logged in the query window opens up just like the one in SQL Server Management studio. There is a option Database next to which one can see the current database you are connected to. This feature comes in handy when there is development going on in a VS 2010 environment and at the same data needs to be explored. The integration between VS 2010 and SSMS seems very close in VS 2010. When a query is written, it can highlighted and when the right click on the mouse is pressed, one can see a popup menu being displayed.